Wuest: You heard that it was said by those of a previous time, You shall not commit murder, and whoever commits murder shall be subject to the judgment. From this verse and Mt 5:20, it follows that the 6 segments in Mt 5:21-48 serve at least a twofold purpose: (1) To teach what righteousness looks like that surpasses the Scribes and Pharisees and (2) To describe the righteousness when lived out in the power of the Spirit gives a proper opinion of our heavenly Father. Keep this command in (Mt 5:16-note) in mind as you meditate on each segment. Ask yourself in each case "Do my attitudes and actions in this area of my life give others I meet a proper opinion of my Father Who is in heaven?" We are called to be perfect as our heavenly Father is perfect (Mt 5:48-note) that the world might see His glory in and through us. This is a "heavy" calling but best of all it is a holy calling which He has enabled citizens under the New Covenant to carry out by virtue of their new hearts upon which the Law is written and the indwelling Spirit Who causes us to walk according to His statutes. It is interesting that Jesus begins with an emphasis on the sanctity of every human life and the call on Kingdom citizens to do all they can to honor that sanctity. In Mt 5:48 (note) Jesus climaxes this section with the incredible statement to be perfect as your heavenly Father is perfect. Citizens of the Kingdom of Heaven are called to measure themselves not by others but by their Father Who art in heaven. The “sons” are to be perfect, as their heavenly Father is perfect. and as Jesus proceeds to explain, that perfection is absolute perfection and includes our words (notes Matthew 5:33-35, 5:36-37), our responses to injuries (Mt 5:38, 39, 40, 41, 42-notes Mt 5:38-39, 40-42), and our dealings with our enemies (Mt 5:43, 44, 45, 46, 47, 48-notes Mt 5:43-45, 46-48). They were so worried about the little details of the letter of the Law but they were missing the heart of the Law and that is what Jesus explains with 6 illustrations in Mt 5:21-48. You have heard suggests that the multitudes listening had for the most part not studied the Law of Moses for themselves but had only heard the teaching on the Law, most likely from the scribes and Pharisees. Ancients (744) (archaios [word study] from arche = beginning) means old, expressing that which was from the beginning in contrast to palaios [word study], old, as having existed a long period of time. Archaios reaches back to a beginning, whenever that beginning may have been. TDNT says archaios "means “from the beginning,” then “past” or “old,” often with a reference to origins and with something of the dignity of “ancient.” In the LXX it can sometimes have the sense of pre-temporal, as in Is 37:26… in 2Co 5:17 pre-resurrection (Ed: Before our "co-crucifixion" and "co-resurrection" with Christ) religious relations and attitudes are in view. Murder (5407) (phoneuo) (Dictionary Article) means to kill a man unjustly. Webster (modern version) says that murder is the crime of unlawfully killing a person especially with malice aforethought. (See topic Murder) In the OT passages (Exodus 20:13; Deuteronomy 5:17) the Hebrew word for "murder" refers to pre-meditated, deliberate, intentional murder not accidental killing. The 1828 edition of Webster's Dictionary defines murder as "he act of unlawfully killing a human being with premeditated malice, by a person of sound mind. To constitute murder in law, the person killing another must be of sound mind or in possession of his reason, and the act must be done with malice prepense, aforethought or premeditated; but malice may be implied, as well as express." William Barclay - But startling as was Jesus' accent of authority, the standard which he put before men was more startling yet. Jesus said that in God's sight it was not only the man who committed murder who was guilty, the man who was angry with his brother was also guilty and liable to judgment. It was not only the man who committed adultery who was guilty; the man who allowed the unclean desire to settle in his heart was also guilty. Here was something which was entirely new, something which men have not yet fully grasped. It was Jesus' teaching that it was not enough not to commit murder; the only thing sufficient was never even to wish to commit murder. It was Jesus' teaching that it was not enough not to commit adultery; the only thing sufficient was never even to wish to commit adultery. It may be that we have never struck a man; but who can say that he never swished to strike a man? It may be that we have never committed adultery; but who can say that he has never experienced the desire for the forbidden thing? It was Jesus' teaching that thoughts are just as important as deeds, and that it is not enough not to commit a sin; the only thing that is enough is not to wish to commit it. It was Jesus' teaching that a man is not judged only by his deeds, but is judged even more by the desires which never emerged in deeds. By the world's standards a man is a good man, if he never does a forbidden thing. The world is not concerned to judge his thoughts. By Jesus' standards, a man is not a good man until he never even desires to do a forbidden thing. Jesus is intensely concerned with a man's thoughts. Three things emerge from this. (i) Jesus was, profoundly right, for Jesus' way is the only way to safety and to security. To some extent every man is a split personality. There is part of him which is attracted to good, and part of him which is attracted to evil. So long as a man is like that, an inner battle is going on inside him. One voice is inciting him to take the forbidden thing; the other voice is forbidding him to take it. Plato likened the soul to a charioteer whose task it was to drive two horses. The one horse was gentle and biddable and obedient to the reins and to the word of command; the other horse was wild and untamed and rebellious. The name of the one horse was reason; the name of the other was passion. Life is always a conflict between the demands of the passions and the control of the reason. The reason is the leash which keeps the passions in check. But, a leash may snap at any time. Self-control may be for a moment off its guard--and then what may happen? So long as there is this inner tension, this inner conflict, life must be insecure. In such circumstances there can be no such thing as safety. The only way to safety, Jesus said, is to eradicate the desire for the forbidden thing for ever. Then and then alone life is safe. (ii) If that be so, then God alone can judge men. We see only a man's outward actions; God alone sees the secret of his heart. And there will be many a man, whose outward actions are a model of rectitude, whose inward thoughts stand condemned before God. There is many a man who can stand the judgment of men, which is bound to be a judgment of externals, but whose goodness collapses before the all-seeing eye of God. (iii) And if that be so, it means that every one of us is in default; for there is none who can stand this judgment of God. Even if we have lived a life of outward moral perfection, there is none who can say that he never experienced the forbidden desire for the wrong things. For the inner perfection the only thing that is enough for a man to say is that he himself is dead and Christ lives in him. "I have been crucified with Christ," said Paul. "It is no longer I who live, but Christ who lives in me" (Galatians 2:19-20). Note that enochos is used four times in Mt 5:21–22, and each use refers to a different court before which the accused must appear and plead his case. Notice that the "courts" progress from court to Supreme Court to Gehenna, the "highest" court of judgment! Liable (1777) (enochos from enécho = to hold in, i.e., to ensnare, to be entangled - Gal 5:1) literally means held fast in (in the grasp, held in, contained in) and is an adjective describing one "in danger of," "liable to judgment and punishment in a legal forensic sense" (Mt 5:21), or "deserving (worthy) of (and subject to punishment)" (describing the crowd's antipathy toward Jesus = Mt 26:66, Mk 14:64). To be held fast, bound, obliged. Shall be liable to the court - Literally "Shall be in danger of judgment"
Enochos means being guilty of having done wrong and thus deserving some particular penalty. It describes deeds that were open to judicial indictment (cf. Mt 5:21, 22; 26:66; Mk 3:29; 14:64; Jas 2:10). Enochos is primarily a legal term - liable to a charge or action at law or in court. Enochos conveys a spiritual It also has a spiritual sense in 1Co. 11:27, where those who partake of the Lord’s Supper in an unworthy way are deemed “guilty” of despising the body and blood of the Lord. Webster on guilty - justly chargeable with or responsible for a usually grave breach of conduct or a crime; deserving reproach or punishment. Guilty implies responsibility for or consciousness of crime, sin, or, at the least, grave error or misdoing. In Numbers 35:31 enochos describes "a murderer who is guilty of death (Lxx = enochos)." In Genesis 26:11 "Abimelech charged all the people, saying, "He who touches this man or his wife shall surely be put to death (Lxx = thanatos [death] + enochos = "liable to death")." Thayer on enochos - one who is held in anything, so that he cannot escape; bound, under obligation, subject to, liable: with the genitive of the thing by which one is bound (douleias - Heb 2:15). Enochos is used of one who is held by, possessed with, love and zeal for anything. As in Greek writings, chiefly in a forensic sense, denoting the connection of a person either with his crime, or with the penalty or trial, or with that against whom or which he has offended; so a. absolutely guilty, worthy of punishment: Lev 20:9,11,13,16,27. BDAG - (1). pertaining to being held in or constrained = subject to (Heb 2:15). (2) Pertaining to being required to give an account for something held against one = liable, answerable, guilty. NIDNTT - Greek literature has the adjective enochos, derived from enechō (Pindar), meaning to hold fast; pass., to be held fast, be subject to (Plato, Xenophon, Isocrates). It is frequently used as a technical legal term: a person is made liable, or subject to a certain penalty under the law. The forum (law court, laws, men or gods) before which he is guilty or liable is usually referred to in the dative. The Septuagint has enochos 21 times in the same sense as secular Greek. The term is used in the LXX chiefly to refer to a person who is condemned to → death because of an action incurring blood-guilt. Enochos - 10x in 8v - The NAS renders it as deserving(2), guilty(6), liable to(1), subject to(1). Matthew 5:21 "You have heard that the ancients were told, 'YOU SHALL NOT COMMIT MURDER ' and 'Whoever commits murder shall be liable to the court.' 22 "But I say to you that everyone who is angry with his brother shall be guilty before the court; and whoever says to his brother, 'You good-for-nothing,' shall be guilty before the supreme court; and whoever says, 'You fool,' shall be guilty enough to go into the fiery hell. NIDNTT comments - Here, in a threefold progression, the respective courts before which a lawbreaker is arraigned are referred to in the dative: krisis, local court; synedrion, supreme national court; gehenna, → hell (the place of punishment is named at once in the accusative instead of the supreme judge). The lesser or greater degree of guilt is reflected in the nature of the court and the severity of the punishment involved. Matthew 26:66 what do you think?" They answered, "He deserves death!" Mark 14:64 "You have heard the blasphemy; how does it seem to you?" And they all condemned Him to be deserving of death. 1 Corinthians 11:27 Therefore whoever eats the bread or drinks the cup of the Lord in an unworthy manner, shall be guilty of the body and the blood of the Lord. Hebrews 2:15 and might free those who through fear of death were subject to slavery all their lives. James 2:10 For whoever keeps the whole law and yet stumbles in one point, he has become guilty (accountable) of all. Zodhiates - (Enochos in this context means) Bound by sin or guilt, guilty of sin and consequently obliged to punishment on that account (James 2:10). NIDNTT - Every single sin, however insignificant it may appear to be, makes the doer “totally guilty”, and therefore liable to → judgment. A T Robertson - There is Talmudic parallel: “If a man do all, but omit one, he is guilty for all and each.” This is a pertinent principle also for those who try to save themselves. But James is urging obedience to all God’s laws. Enochos is used several times to translate the phrase "bloodguiltiness" (Ex 22:3, Lev 20:9, 11-13, 16, 27). Greek: ego de lego (1SPAI) humin oti pas o orgizomenos (PPPMSN) to adelpho autou enochos estai (3SFMI) te krisei; os d' an eipe (3SAAS) to adelpho autou, Raka, enochos estai (3SFMI) to sunedrio; ov d' an eipe, (3SAAS) More, enochos estai (3SFMI) eis ten geennan tou puros. KJV: But I say unto you, That whosoever is angry with his brother without a cause shall be in danger of the judgment: and whosoever shall say to his brother, Raca, shall be in danger of the council: but whosoever shall say, Thou fool, shall be in danger of hell fire. Wuest: But, as for myself, I am saying to you that everyone who is provoked to anger against his brother shall be subject to the judgment. Moreover, whoever says to his brother, Raca, that is, you senseless empty-head, shall be liable to the Sanhedrin. But whoever shall say, Mōre, that is, you imprudent man without forethought or wisdom, shall be liable to the hell of fire. Young's Literal: but I -- I say to you, that every one who is angry at his brother without cause, shall be in danger of the judgment, and whoever may say to his brother, Empty fellow! shall be in danger of the Sanhedrim, and whoever may say, Rebel! shall be in danger of the gehenna of the fire. BUT I SAY TO YOU THAT EVERYONE WHO IS ANGRY WITH HIS BROTHER SHALL BE GUILTY BEFORE THE COURT: ego de lego (1SPAI) humin oti pas o orgizomenos (PPPMSN) to adelpho autou enochos estai (3SFMI) te krisei. But - Another striking term of contrast. Ellicott - I say unto you.—The I is emphasized in the Greek ("Ego" is first word in sentence). It was this probably that, more than anything else, led to the feeling of wonder expressed in Matthew 7:28-29. The scribe in his teaching invariably referred to this Rabbi and that; the new Teacher spoke as one having a higher authority of His own. But you are saying "I have never murdered anyone". Jesus says "Wrong. If you've hated you are guilty." The OT law dealt only with outward actions, but citizens of the kingdom of heaven must beware of sinful inward attitudes. In fact, the attitudes Jesus calls for can only be fulfilled by those with a New Heart and His Spirit, for otherwise they are an utterly impossible standard which climaxes in the highest of all impossible standards to "Be perfect as your heavenly Father is perfect." Only citizens of the Kingdom of heaven, genuine believers, can obey Jesus' instructions and commands, doing so not because of outward constraints (not "under Law") but because of an inward life ("under grace") enabled by the indwelling Spirit of the Living God. You might argue that the Holy Spirit is not even mentioned in the Sermon on the Mount and you would be correct. But from the character of the life Jesus calls for, it is unarguably clear that one cannot practice such behavior apart from the Spirit’s empowerment (see Romans 8, notes begin on Romans 8:1). The point is that Jesus was not saying anything new or different than had already been plainly stated in the Law. He is in no way diminishing the Law. He is showing that the keeping of God's Law has always been an issue of a heart out of which flows that person's loving obedience for God and his fellow man. "But I say" uses both the first person singular of the verb for say (lego) and the first person singular pronoun (ego) "I" for emphasis. One might paraphrase to bring out the emphatic character as "I myself say." The point is that He emphasizing His authority as on a plain with the Law and is not merely speaking content. Stated another way, "But I say" is a way Jesus equated His Word with the authority of Scripture and thus with the authority of God, which is valid in view of the fact hat Jesus is "the Word" (John 1:1). In fact, indirectly by introducing the sentence in this manner, Jesus was underscoring His deity. Jesus did not rely on the words of other men as did the scribes and Pharisees. Jesus is not speaking words that contradict or conflict with the the Law and the Prophets, but fulfilling those words, giving them the true meaning God had intended. 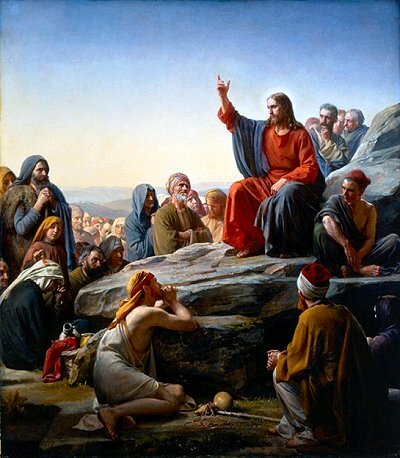 Similar Jesus is not altering, diminishing or depriving even the least of the commandments of their authority (Ro 5:19 note) Jesus is correcting the perversion of the Law by the scribes and Pharisees who had devised 613 manmade rules that only tied heavy burdens on the people who were told that "Keep all 613 prohibitions and commandments and you will be pleasing to Him and satisfy His demands for righteousness." The problem of course was that their external rules left the heart unchanged, still more deceitful than all else and desperately sick (Jer 17:9, cf Ge 8:21). The KJV has the phrase "without a cause", a phrase not found in most of the modern versions. Angry (3710) (orgizo from orge = wrath) means to be or become angry, furious, enraged or provoked and is used in the NT of human and satanic anger. (See Topic Anger) Orgizo describes a brooding, simmering anger that is nurtured and not allowed to die. It is seen in the holding of a grudge, in the smoldering bitterness that refuses to forgive. It is the anger that cherishes resentment and does not want reconciliation. Orgizo - 8x in 8v - Mt 5:22; 18:34; 22:7; Luke 14:21; 15:28; Eph 4:26; Rev 11:18; 12:17. The NAS renders it as angry(4), enraged(3), moved with anger(1). The Scribes and Pharisees taught that anything short or murder might be allowed. Jesus brings the Law back to the matters of the heart teaching that the danger of anger was that it was expressive of a murderous intent in the heart and such a one was in danger of the judgment. Jesus says that anger merits execution, because the fruit of anger is murder. Anger is what we feel when we believe that we have been wronged by someone. It springs from resentment over an offense and contempt for the individual. It results in an adversarial relationship that has the potential to disrupt fellowship and worship alike. Warren Wiersbe - Anger is an emotional arousal caused by something that displeases us. In itself, anger is not a sin, because even God can be angry (Dt 9:8, 20; Ps 2:12). The Bible often speaks of anger “being kindled” (Ge 30:2; Dt 6:15), as though anger can be compared to fire. It is difficult for us to practice a truly holy anger or righteous indignation because our emotions are tainted by sin, and we do not have the same knowledge that God has in all matters. God sees everything clearly and knows everything completely, and we do not. The NT principle seems to be that the believer should be angry at sin but loving toward people. The fire of anger, if not quenched by loving forgiveness, will spread and defile and destroy the work of God (Ed note: and the testimony of God's people). According to Jesus, anger is the first step toward murder (Mt 5:21, 22, 23, 24, 25, 26), because anger gives the devil a foothold in our lives, and Satan is a murderer (Jn 8:44). Satan hates God and God’s people, and when he finds a believer with the sparks of anger in his heart, he fans those sparks, adds fuel to the fire, and does a great deal of damage to God’s people and God’s church. Both lying and anger “give peace to the devil” (Eph 4:27-note). Horace wrote that “Anger is momentary insanity.” But that is not to say as do our law courts today that the angry person is not responsible because clearly they are! Good for nothing (RACA) (4469) (RACA = Aramaic word equivalent to Hebrew rebq = senseless, empty headed man, worthless, term of utter vilification) refers to a vain, empty (empty headed) or worthless fellow and was used as a term of reproach and utter contempt by the Jews in the time of Christ. A few sources say raca is derived from a term for spit, but most feel that is probably not the correct etymology. TDNT - The Aramaic term expresses disparagement accompanied by anger and contempt. Addressed to the foolish, thoughtless, or presumptuous person, it means “blockhead,” and is the most common term of abuse in Jesus' day. English synonyms with a similar idea include nitwit, blockhead, numbskull, bonehead or brainless idiot. Clearly raca expressed utmost contempt for an individual's intelligence (or supposed lack of)! Africa Bible Commentary - These Jewish insults are similar to the African ‘son of a dog’. Adam Clarke - Raca signifies a vain, empty, worthless fellow, shallow brains, a term of great contempt. Such expressions were punished among the Gentoos by a heavy fine. A. B. Bruce: "Raca expresses contempt for a mans head-you stupid! Moros expresses contempt for his heart and character-you scoundrel"
Although I could not find this in any other references (so it may not be accurate), the Cambridge Bible for Schools and Colleges says raca is "a word of contempt, said to be from a root meaning to spit." George Wood - Raca—that is equivalent to murder in God's eyes. Raca is an epithet. Its use is similar to a racial expletive in modern times. It serves to insult someone. Chip Bell - "Raca sounds like spitting and means “empty head”." Sam Storms - By “insult” (i.e., saying “Raca”, an Aramaic term meaning “empty [headed]”) Jesus refers to the mocking of an individual’s intelligence. This isn’t merely a casual reference to a person’s IQ or the equivalent of our calling someone a “nitwit” or “blockhead” or “boneheaded dufus.” He has in mind an angry and dismissive belittling that is designed to embarrass and humiliate. John Gill - Raca is expressive of indignation and contempt; it was used as a term of reproach. Some derive it from qqr to "spit upon"; as if the person that used it thought the man he spoke to deserved to be spit upon, and treated in the most contemptuous manner: but rather the word signifies "empty" and "vain", and denotes a worthless, empty headed man; a man of no brains; a foolish, witless, fellow. Ray Pritchard - “Raca” is an Aramaic insult that means something like “You worthless son of a motherless goat.” (Not a literal translation!) Or it might mean “You brainless blockhead” or “You idiot” or “You moron.” I think you get the picture. You said “Raca” when you were angry and wanted to insult a person. It was an attack on a person’s self-worth and dignity. The same is true of “You fool!” It’s an attack on a person’s character. But what about the person who says, “I wish you were dead.” God takes that seriously. Proverbs 18:21 says, “The tongue has the power of life and death.” Do you realize that saying “I wish you were dead” is really a prayer to God? You are speaking death into a particular situation. That’s a way of murdering people! Some of you are so good at it that you ought to be hired by the Mafia as professional hit-men! You are so fast and so clean about it that you can kill two people on the way to the water fountain and step over their corpses on the way back to your desk. No blood! But you’re a murderer in God’s eyes! You’ve killed with your abusive, unkind speech. Adrian Rogers on RACA - What is the Lord saying? The Lord says, "If your heart is a malevolent heart that burns with anger toward other people, if you look down upon any human being made in the image of God, and you speak contemptuously, if you have contempt and abhorrence of a human being, if you say, "Raca, you fool," the Lord wrote down in Heaven, "Murder, murder, murder." The anger that people have—the anger! You see them, at intersections or wherever, get in a little traffic snarl, and see them just express—the blood rushes to the face—and they'll beep the horn, and they'll get so angry that you know that if It were not against the law, they would take a life—if it were not against the law; the only thing that keeps them from doing it here—murder. Phil Newton on Mt 5:21-22 - To begin with, Jesus is not giving stages or degrees leading to murder but showing the different manifestations of the same heart attitude. "Anger" may manifest itself in lashing out, verbally or physically attacking someone, or in vitriolic behavior. What we sometime call ranting and raving may be signs of anger. It may also be what has been termed passive-aggressive in which the angry person may not say anything ugly but treats the other person or persons with personal contempt. It may be the silent treatment or even manifest in what he does not say to another person when he should be commenting in a helpful, relational fashion. "Anger" often shows up in a spousal relationship in which one spouse may demonstrate anger at the other by silence, non-involvement, lack of kindness and gentleness, disregard for showing tenderness and concern. It happens in parent-child relationships and even in work settings. The slow, seething of the angry person looks for ways to express animosity as much by what he does not do as by what he does. "You good-for-nothing," or raca is Aramaic for a term meaning "empty-head" or what we may call without a sense of levity, "numb-skull," "blockhead," or "dingbat." I suppose that we could add dozens of other names that convey the same general idea. This views the other person as inferior - so obviously, pride is part of anger's root. It is a disdainful attitude verbally expressed in insults to another. Spurgeon on RACA - Murder lies within anger, for we wish harm to the object of our wrath, or even wish that he did not exist, and this is to kill him in desire. Anger “without a cause” is forbidden by the command which says “Thou shalt not kill;” for unjust anger is killing in intent. Such anger without cause brings us under higher judgment than that of Jewish police-courts. God takes cognizance of the emotions from which acts of hate may spring, and calls us to account as much for the angry feeling as for the murderous deed. Words also come under the same condemnation: a man shall be judged for what he “shall say to his brother.” To call a man Raca, or a worthless fellow, is to kill him in his reputation, and to say to him, “Thou fool,” is to kill him as to the noblest characteristics of a man. Hence all this comes under such censure as men distribute in their councils; yes, under what is far worse, the punishment awarded by the highest court of the universe, which dooms men to “hell fire.” Thus our Lord and King restores the law of God to its true force, and warns us that it denounces not only the overt act of killing, but every thought, feeling, and word which would tend to injure a brother, or annihilate him by contempt. Jesus is saying that in effect our "cutting words" carry out the "assassination" of the person using the weapon of the tongue and those words that proceed from a heart filled with animosity, enmity or anger. When you call another man or woman made in the image of God, you are in effect taking the place of God and when you say "raca" or "you fool" you are holding them with lower esteem than God Himself does and thus it is a grievous sin. Isn't that what one "says" when they murder another person? They are saying in essence that "Your life is worth less to me than it is to God!" And thus the murderer "takes the place" of God. ILLUSTRATION OF ANGER - One woman went to the doctor. He looked grave. She said, "What's wrong?" He said, "Madam, you have hydrophobia. You have rabies." She got out a pencil and started to write. He said, "What are you doing—making your will?" She said, "No, I'm making a list of people I'm going to bite." I believe I met her sister on one occasion. William Barclay - Here is the first example of the new standard which Jesus takes. The ancient law had laid it down: "You shall not kill" (Exodus 20:13); but Jesus lays it down that even anger against a brother is forbidden. In the King James Version the man who is condemned is the man who is angry with his brother without a cause. But the words without a cause are not found in any of the great manuscripts, and this is nothing less than a total prohibition of anger. It is not enough not to strike a man; the only thing that is enough is not even to wish to strike him; not even to have a hard feeling against him within the heart. In this passage Jesus is arguing as a Rabbi might argue. He is showing that he was skillful in using the debating methods which the wise men of his time were in the habit of using. There is in this passage a neat gradation of anger, and an answering neat gradation of punishment. (i) There is first the man who is angry with his brother. The verb here used is orgizesthai (orgizo). In Greek there are two words for anger. There is thumos , which was described as being like the flame which comes from dried straw. It is the anger which quickly blazes up and which just as quickly dies down. It is an anger which rises speedily and which just as speedily passes. There is orge, which was described as anger become inveterate. It is the long-lived anger; it is the anger of the man who nurses his wrath to keep it warm; it is the anger over which a person broods, and which he will not allow to die. That anger is liable to the judgment court. The judgment court is the local village council which dispensed justice. That court was composed of the local village elders, and varied in number from three in villages of fewer than one hundred and fifty inhabitants, to seven in larger towns and twenty-three in still bigger cities. So, then, Jesus condemns all selfish anger. The Bible is clear that anger is forbidden. "The anger of man," said James, "does not work the righteousness of God" (James 1:20). Paul orders his people to put off all "anger, wrath, malice, slander" (Colossians 3:8). Even the highest pagan thought saw the folly of anger. Cicero said that when anger entered into the scene "nothing could be done rightly and nothing sensibly." In a vivid phrase Seneca called anger "a brief insanity." So Jesus forbids for ever the anger which broods, the anger which will not forget, the anger which refuses to be pacified, the anger which seeks revenge. If we are to obey Jesus, all anger must be banished from life, and especially that anger which lingers too long. It is a warning thing to remember that no man can call himself a Christian and lose his temper because of any personal wrong which he has suffered. (ii) Then Jesus goes on to speak of two cases where anger turns into insulting words. The Jewish teachers forbade such anger and such words. They spoke of "oppression in words," and of "the sin of insult." They had a saying, "Three classes go down to Gehenna and return not--the adulterer, he who puts his neighbour openly to shame, and he who gives his neighbour an insulting name." Anger in a man's heart, and anger in a man's speech are equally forbidden. First of all, the man who calls his brother Raca is condemned. Raca (see rhaka, compare Hebrew 7386 = reyq e.g., "vain" in Jdg 9:4, 2Sa 6:20) is an almost untranslatable word, because it describes a tone of voice more than anything else. Its whole accent is the accent of contempt. To call a man Raca was to call him a brainless idiot, a silly fool, an empty-headed blunderer. It is the word of one who despises another with an arrogant contempt. There is a Rabbinic tale of a certain Rabbi, Simon ben Eleazar. He was coming from his teacher's house, and he was feeling uplifted at the thought of his own scholarship and erudition and goodness. A very ill-favoured passer-by gave him a greeting. The Rabbi did not return the greeting, but said, "You Raca! How ugly you are! Are all the men of your town as ugly as you?" "That," said the passer-by, "I do not know. Go and tell the Maker who created me how ugly is the creature he has made." So there the sin of contempt was rebuked. The sin of contempt is liable to an even severer judgment. It is liable to the judgment of the Sanhedrin (sunedrion), the supreme court of the Jews. This of course is not to be taken literally. It is as if Jesus said: "The sin of inveterate anger is bad; the sin of contempt is worse." There is no sin quite so unchristian as the sin of contempt. There is a contempt which comes from pride of birth, and snobbery is in truth an ugly thing. There is a contempt which comes from position and from money, and pride in material things is also an ugly thing. There is a contempt which comes from knowledge, and of all snobberies intellectual snobbery is the hardest to understand, for no wise man was ever impressed with anything else than his own ignorance. We should never look with contempt on any man for whom Christ died. (iii) Then Jesus goes on to speak of the man who calls his brother moros (Greek #3474). Moros also means fool, but the man who is moros is the man who is a moral fool. He is the man who is playing the fool. The Psalmist spoke of the fool who has said in his heart that there is no God (Psalms 14:1). Such a man was a moral fool, a man who lived an immoral life, and who in wishful thinking said that there was no God. To call a man moros was not to criticise his mental ability; it was to cast aspersions on his moral character; it was to take his name and reputation from him, and to brand him as a loose-living and immoral person. So Jesus says that he who destroys his brother's name and reputation is liable to the severest judgment of all, the judgment of the fire of Gehenna. Gehenna is a word with a history; often the Revised Standard Version translates it "hell." The word was very commonly used by the Jews (Matthew 5:22; Matthew 5:29-30; Matthew 10:28; Matthew 18:9; Matthew 23:15; Matthew 23:33; Mark 9:43; Mark 9:45; Mark 9:47; Luke 12:5; James 3:6). It really means the Valley of Hinnom. The Valley of Hinnom is a valley to the south-west of Jerusalem. It was notorious as the place where Ahaz had introduced into Israel the fire worship of the heathen God Molech, to whom little children were burned in the fire. "He burned incense in the valley of the son of Hinnom, and burned his sons as an offering" (2 Chronicles 28:3). Josiah, the reforming king, had stamped out that worship, and had ordered that the valley should be for ever after an accursed place. "He defiled Topheth, which is in the valley of the sons of Hinnom, that no one might burn his son or his daughter as an offering to Molech" (2 Kings 23:10). In consequence of this the Valley of Hinnom became the place where the refuse of Jerusalem was cast out and destroyed. It was a kind of public incinerator. Always the fire smouldered in it, and a pall of thick smoke lay over it, and it bred a loathsome kind of worm which was hard to kill (Mark 9:44-48). So Gehenna, the Valley of Hinnom, became identified in people's minds with all that was accursed and filthy, the place where useless and evil things were destroyed. That is why it became a synonym for the place of God's destroying power, for hell. So, then, Jesus insists that the gravest thing of all is to destroy a man's reputation and to take his good name away. No punishment is too severe for the malicious tale-bearer, or the gossip over the teacups which murders people's reputations. Such conduct, in the most literal sense, is a hell-deserving sin. Anger is a wind which blows out the lamp of the mind. Anon. Anger is an acid that can do more harm to the vessel in which it is stored than to anything on which it is poured. Anon. Anger is as a stone cast into a wasp's nest. Anon. Anger is just one letter short of danger. Anon. Anger is often more hurtful than the injury that caused it. Anon. Don't fly into a rage unless you are prepared for a rough landing. Anon. He who can suppress a moment's anger may prevent a day of sorrow. Anon. Nothing can cook your goose quicker than boiling anger. Anon. One thing that improves the longer it is kept is your temper. Anon. Sharp words make more wounds than surgeons can heal. Anon. The anger of today is the remorse of tomorrow. Anon. Two things a man should never be angry at: what he can help, and what he cannot help. Anon. Be guilty before the Supreme Court - Offences of this kind are placed by our Lord on the same level as those which came before the great court of the Sanhedrim. Supreme court (4892) (sunedrion from sun/syn = together + hedra = a seat or hedraios = sedentary, as one seated in a chair) means ones seated together. This noun generally describes an assembly or council. In classical Greek sunhedrion initially referred to the place of meeting; and later described the assembly itself or the “council.” In secular language sunedrion was used of a variety of official groups and councils including legislative bodies. In the intertestamental period prior to the birth of Christ sunedrion became a technical term for the "supreme court" or “high court” of the Jews who adopted the Greek into their own language (Hebrew/ Aramaic), calling the council the Sanhedrin. In the NT uses the council or Sanhedrin consisted of 71 members (70 members plus the highest official, the high priest) from the chief priests, former high priests, and the chief priests or heads of the twenty–four courses or divisions, elders, and scribes or lawyers. Apparently the council itself determined who could belong. There were also local councils throughout the Jewish Diaspora with 23 members, which were also called sunedrion. The Sanhedrin tried the most serious offenses and pronounced the severest penalties, including death by stoning (see Acts 6:12-7:60) The Sanhedrin was formed in imitation of the seventy elders appointed by Moses (Nu 11:16ff.) The members were selected from the chief priests, former high priests, and the chief priests or heads of the twenty–four courses or divisions, elders, and scribes or lawyers. The Jewish genealogical records were kept by the Sanhedrin but they ceased to exist after the destruction of the Temple by the Romans in 70 A D.
William Barclay on Sanhedrin (from his commentary on Jesus' trial in Mark 14) - There is no doubt that in the trial of Jesus the Sanhedrin broke all its own laws. The regulations for the procedure of the Sanhedrin are in one of the tractates of the Mishnah. Naturally enough some of these regulations are rather ideals than actual practices but, even allowing for that, the whole procedure of this night was a series of flagrant injustices. The Sanhedrin was the supreme court of the Jews and was composed of seventy-one members. Within its membership there were Sadducees—the priestly classes were all Sadducees—Pharisees and Scribes, who were experts in the law, and respected men who were elders. It appears that any vacancies in the court were filled by co-option. The High Priest presided over the court. The court sat in a semi-circle in such a way that any member could see any other member. Facing it sat the students of the Rabbis. They were allowed to speak on behalf of the person on trial but not against him. The official meeting place of the Sanhedrin was the Hall of Hewn Stone ((watch this computer animation)) which was within the Temple precincts, and the decisions of the Sanhedrin were not valid unless reached at a meeting held in that place. The court could not meet at night, nor could it meet at any of the great feasts. When evidence was taken, witnesses were examined separately and their evidence to be valid must agree in every detail. Each individual member of the Sanhedrin must give his verdict separately, beginning from the youngest and going on to the eldest. If the verdict was a verdict of death, a night must elapse before it was carried out, so that the court might have a chance to change its mind and its decision towards mercy. One of the functions of the Sanhedrin was to deal with any man who was suspected of being a false prophet. A synonymous term for sunedrion is bouleutḗs used in Mark 15:43 and Luke 23:50+ to describe Joseph of Arimathea who buried Jesus in his unused tomb. Sunedrion -22x in 22v- Council(m)(17), council(2), courts(m)(2), supreme court(m)(1). Spurgeon - Christ here shows us that the commandment, “Thou shalt not kill,” deals with anger, with angry words, with words of cursing, with words of derision, for all these are killing things, hurting and wounding things, and the passion of anger is forbidden under the command, “Thou shalt not kill.” Men have not thought so, but it really is so, for he who is angry with his brother is a murderer; there is the spirit, the essence of that which leads to murder in the passion which breeds malice and revenge. The law is spiritual; it touches the emotions, the thoughts, the desires, as well as the words and actions of men. If I desire ill for a man, I have within me that which would desire his death; and what is that, after all, but murder in the heart? How strict is this law, and yet how just and right! Compare the derivative moria = Folly, foolishness, absurdity (1Cor. 1:18, 21, 23; 2:14; 3:19). There are a number of synonyms including blockhead, bonehead, dimwit, dork, numbskull, and the list goes on and on. Jesus seems to characterize calling someone a fool as a more serious reproach than a "good for nothing". Webster on fool, foolish - lacking in sense, judgment, or discretion. Foolish implies the character of being or seeming unable to use judgment, discretion, or good sense. Unwise; imprudent; acting without judgment or discretion in particular things. The Septuagint uses moros twice in a passage that gives us a "descriptive definition" of moros - Isaiah 32:5 No longer will the fool (moros) be called noble, Or the rogue be spoken of as generous. 6 For a fool (moros) speaks nonsense, And his heart inclines toward wickedness: To practice ungodliness and to speak error against the LORD, To keep the hungry person unsatisfied And to withhold drink from the thirsty. Moros - 12x in 12v - NAS renders moros as fool(1), foolish(7), foolish things(1), foolishness(1), fools(2). Matthew 5:22 "But I say to you that everyone who is angry with his brother shall be guilty before the court; and whoever says to his brother, 'You good-for-nothing,' (Raca) shall be guilty before the supreme court; and whoever says, 'You fool,' shall be guilty enough to go into the fiery hell. Matthew 7:26 "Everyone who hears these words of Mine and does not act on them, will be like a foolish man who built his house on the sand. Comment - A fool hears truth and does not obey. Matthew 23:17 "You fools and blind men! Which is more important, the gold or the temple that sanctified the gold? Matthew 25:2 "Five of them (virgins) were foolish, and five were prudent. 1 Corinthians 1:25 Because the foolishness of God is wiser than men, and the weakness of God is stronger than men. 1 Corinthians 3:18 Let no man deceive himself. If any man among you thinks that he is wise in this age, he must become foolish, so that he may become wise. MacArthur - Human wisdom is moronic in the Lord’s sight. 1 Corinthians 4:10 We are fools for Christ's sake, but you are prudent in Christ; we are weak, but you are strong; you are distinguished, but we are without honor. 2 Timothy 2:23 But refuse foolish and ignorant speculations, knowing that they produce quarrels. Titus 3:9 But avoid foolish controversies and genealogies and strife and disputes about the Law, for they are unprofitable and worthless. Deuteronomy 32:6 "Do you thus repay the LORD, O foolish and unwise people? Is not He your Father who has bought you? He has made you and established you. Psalm 94:8 Pay heed, you senseless among the people; And when will you understand, stupid ones? Jeremiah 5:21 'Now hear this, O foolish and senseless people, Who have eyes but do not see; Who have ears but do not hear. Hell (Gehenna) (1067) (geenna from Hebrew gay = valley + Hinnom = a deep narrow ravine south of Jerusalem once associated with the pagan god Moloch and his disgusting rite of infant sacrifices [cp modern practice of abortion! ], 2Kings 23:10; 2Chr 28:3; 33:6; Jer 7:31, 19:5, 6, 32:35; Ezekiel 16:20; 23:37 clearly prohibited by God in Lev 18:21, 20:2, 3, 4, 5) is literally the valley of Hinnom, the valley where the filth and dead animals of the city were cast out and burned and where there were trash fires and perpetually burning rubbish, all a fit symbol of the future home of all unrepentant, unregenerate wicked men and women. It was a foul, forbidding place where the fire, smoke, and stench never ceased. It is thus fitting that gehenna is where sin and unrepentant sinners will one day find it's "resting place". Vincent on Gehenna - more accurately, the hell of fire. The word Gehenna, rendered hell, occurs outside of the Gospels only at James 3:6. It is the Greek representative of the Hebrew Ge-Hinnom, or Valley of Hinnom, a deep, narrow glen to the south of Jerusalem, where, after the introduction of the worship of the fire-gods by Ahaz, the idolatrous Jews sacrificed their children to Molech. Josiah formally desecrated it, “that no man might make his son or his daughter pass through the fire to Molech” (2Kings 23:10). After this it became the common refuse-place of the city, into which the bodies of criminals, carcasses of animals, and all sorts of filth were cast. From its depth and narrowness, and its fire and ascending smoke, it became the symbol of the place of the future punishment of the wicked. So Milton: “The pleasant valley of Hinnom, Tophet thence, And black Gehenna called, the type of hell.” As fire was the characteristic of the place, it was called the Gehenna of fire. It should be carefully distinguished from Hades, which is never used for the place of punishment, but for the place of departed spirits, without reference to their moral condition. Both Raca and fool broke the heart of the law against murder, one by slaying a person's intelligence and the other his character. These examples from Scripture all have in common a stubborn rebellion against God, which is not what Jesus is referring to. For a man to call another man "you fool" is in a sense to put himself in the place of God. Jesus is specifically speaking against the deliberate belittling of someone's person because of the animosity and hatred of our own heart. That He says is as if we had murdered them! Have you ever been guilty of "murder"? One should be careful not to misinterpret Jesus as declaring that it makes no difference whether we kill with words like gossip or stab with literal knives of cold steel. What Jesus is teaching is that both activities reveal the same animosity of one's heart to his or her neighbour. The newspaper reported a tragic incident of violence that took place in a South American country. A peasant killed his best friend while they were arguing about political differences. When asked why he did it, he replied with these chilling words: "We began peacefully, and then we argued. I killed him when I ran out of words." This tragedy calls to mind Jesus' teaching in Matthew 5 about the close connection between anger and murder. First He stressed the seriousness of anger (Mt 5:21, 22). He warned that malicious anger, like murder, would be punished by God. Then He gave practical advice designed to defuse anger in a person who has something against another (Mt 5:23, 24, 25, 26). He who conquers his anger conquers a strong enemy. These verses deserve the closest attention of all readers of the Bible. A right understanding of the doctrines they contain lies at the very root of Christianity. The Lord Jesus here explains more fully the meaning of His words, "I came not to destroy the law, but to fulfill." He teaches us that His Gospel magnifies the law, and exalts its authority. He shows us that the law, as expounded by Him, was a far more spiritual and heart-searching rule than most of the Jews supposed. And He proves this by selecting three commandments out of the ten as examples of what He means. He expounds the sixth commandment. Many thought that they kept this part of God's law, so long as they did not commit actual MURDER. The Lord Jesus shows, that its requirements go much further than this. It condemns all angry and passionate language, and especially when used without a cause. Let us mark this well. We may be perfectly innocent of taking life away, and yet be guilty of breaking the sixth commandment. He expounds the seventh commandment. Many supposed that they kept this part of God's law, if they did not actually commit ADULTERY. The Lord Jesus teaches, that we may break it in our thoughts, hearts, and imaginations, even when our outward conduct is moral and correct. The God with whom we have to do looks far beyond actions. With him even a glance of the eye may be a sin. He expounds the third commandment. Many fancied that they kept this part of God's law, so long as they did not swear falsely, and performed their OATHS. The Lord Jesus forbids all vain and light swearing altogether. All swearing by created things, even when God's name is not brought forward--all calling upon God to witness, excepting on the most solemn occasions, is a great sin. Now all this is very instructive. It ought to raise very serious reflections in our minds. It calls us loudly to use great searching of heart. And what does it teach? It teaches us the exceeding holiness of God. He is a most pure and perfect Being, who sees faults and imperfections, where man's eyes often see none. He reads our inward motives. He notes our words and thoughts, as well as our actions. "He requires truth in the inward parts." Oh! that men would consider this part of God's character more than they do! There would be no room for pride, and self-righteousness, and carelessness, if they only saw God "as He is." It teaches us the exceeding ignorance of man in spiritual things. There are thousands and ten thousands of professing Christians, it may be feared, who know no more of the requirements of God's law than the most ignorant Jews. They know the letter of the ten commandments well enough. They fancy, like the young ruler, "all these have I kept from my youth up." They never dream that it is possible to break the sixth and seventh commandments, if they do not break them by outward act or deed. And so they live on satisfied with themselves, and quite content with their little bit of religion. Happy indeed are they who really understand God's law! It teaches us our exceeding need of the Lord Jesus Christ's atoning blood to save us. What man or woman upon earth can ever stand before such a God as this, and plead "not guilty?" Who is there that has ever grown to years of discretion, and not broken the commandments thousands of times? "There is none righteous, no! not one." Without a mighty Mediator, every one would be condemned in the judgment. Ignorance of the real meaning of the law is one plain reason why so many do not value the Gospel, and content themselves with a little formal Christianity. They do not see the strictness and holiness of God's Ten commandments. If they did, they would never rest until they were safe in Christ. In the last place, this passage teaches us the exceeding importance of avoiding all occasions of sin. If we really desire to be holy, we must "take heed to our ways, that we offend not in our tongues." We must be ready to make up quarrels and disagreements, lest they gradually lead on to greater evils. "The beginning of strife is like breaching a dam." We must labor to crucify our flesh and mortify our members, to make any sacrifice and endure any bodily inconvenience rather than sin. We must keep our lips as it were with a bridle, and exercise an hourly strictness over our words. Let men call us precise, if they will, for so doing. Let them say, if they please, that we are "too particular." We need not be moved. We are merely doing as our Lord Jesus Christ bids us, and, if this is the case, we have no cause to be ashamed.